There are certain things that, when held too close, distort our perspective. Emotions and ego can clutter the mind’s eye. 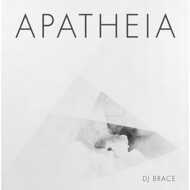 Apatheia, which should not be confused with apathy, involves moving these things to a safe distance. This is not about a loss of feeling or disengaging with the world. The goal is to gain understanding through a disentangling from the chaos that litters the landscape. Unfettered, unburdened, and unobstructed... one can experience freedom of the soul and see the way forward with absolute clarity. We’ve charted a course for you. There are nine sonic signposts to soundtrack your journey. So, immerse yourself in the music and allow it to rinse away the distractions that have been preventing you from experiencing your own apatheia.